This week's winner comes to us from @dribbleglass, friend of the show as well as the man behind PulseofVegas Blog. The picture is part of a story the blog did called 5 Fun Things you can do at Bill's Gamblin' Hall & Saloon. One of the tips was the ability to get some really cool pics of the strip from the pedestrian bridge and escalators by them including this week’s winner. 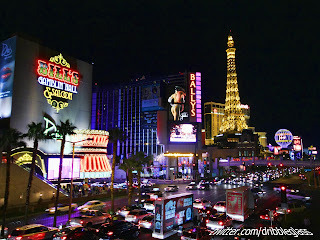 This is a photo of Bill’s and Bally’s at night and it is one of the pictures that immediately took to Vegas in my mind. I’ve been at that exact location and I’ve enjoyed those views and they are stunning. Every once in a while, we see a picture that we know is going to win pic of the week and this was one of them. It’s a great picture and we are thrilled to add it to our “Twitpic of the Week” collection.